I'm going to talk about my favourite toys. I'm not a total grown-up yet, and I don't intend to become one fully ever. This is Sir Quackenbush III, sometimes referred to as the IV by mistake. Sir Quackenbush III is the adopted son of Sir Quackenbush the Second, a yellow duck presented to me by Scott on our first Christmas. Sir Quackenbush the Second is the highly successful son of Quackenbush, a yellow beany baby duck which quacks, presented to me by a friend (was it Devon?) in high school. Sir Quackenbush III believes he is a duck, just like his forefathers, and we have allowed him to believe this. He does in fact quack. He has happily lived as a duck for quite some time, but recently he's been asking questions. I don't feel able at this time to tell him the truth about his adoption. I simply reply, 'But can you quack like a duck? Then you're a duck!' At this point, this satisfies him and ends the matter. But I know far too soon, he will begin to piece together the truth. Sir Q has been like a child to me. He's the right size to be a baby, he's got little chubby legs like a baby and he has a small but adorable wardrobe. He's innocent and loves his daddy and talks to us (often during the night when one of us rolls over on top of him). I love Sir Q. He is currently my favourite toy. He's one of the few toys I will almost refuse to let my kids play with and destroy. Not to mention the very real concern we have of both confusing our kids ('Teacher: What sound does a monkey make? McFarlane Kid: Quack quack quack!') and our kids telling him he's actually a monkey. I'd be remiss not to mention the other favourite toy that I don't want my kids to play with. This is Bobo. While Sir Q may be a great companion, no toy will ever be like Bobo. Bobo and I go back further than I can remember. Bobo has been my lifelong companion. Bobo's been through (and survived) more than most toys; she's undergone about two or three surgeries and more precarious adventures than I can name. She was always willing to ride on the handlebars of my bike or be strung from the ceiling fan and swirled about. She had a rough start in life. 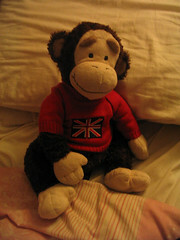 She was supposedly abducted (by me) from her first owner, the neighbour boy Justin, about twenty-two years ago. 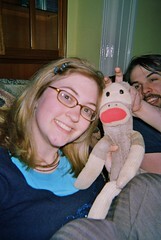 About sixteen years ago, she was betrothed to another sock monkey named Jay Roy. She and Jay Roy were inseparable until Jay Roy went through his anti-girls phase and broke off the engagement. She and Jay Roy remained friends, however, and two years ago, she married Fred. She and Fred are doing very well and often take the responsibility of watching over Sir Quackenbush III (careful not to expose their close biology) and Isabella Snowflake Bear, one of the other main residents of our bedroom. For more on Bobo, I refer you to an essay tribute I wrote to her in university.